I'm Here. I'm Queer. What the Hell do I read? 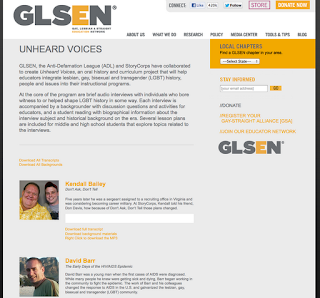 : GLSEN, The Anti-Defamation League and Story Corps' Unheard Voices Project - an incredible resource! GLSEN, The Anti-Defamation League and Story Corps' Unheard Voices Project - an incredible resource! Over the last four Mondays, I've shared a few of the stories that are part of the GLSEN Unheard Voices project. And there are more interviews and teacher guides to explore!